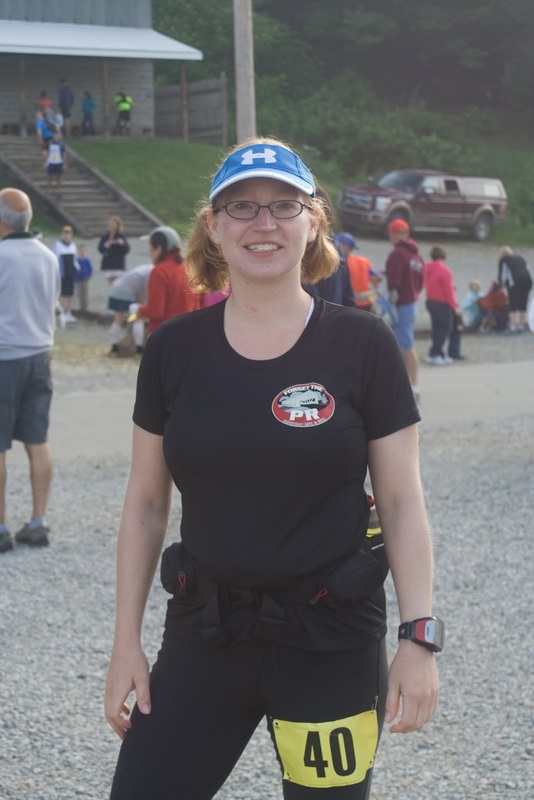 So I know I haven't posted in quite a while, but Saturday, June 9th was my second Ultra race ever, the Laurel Highlands 50k, and I think it deserved some attention before the entire day goes out of my head as if my brain was made of Swiss cheese, which in the few days following the race, it seems to sort of become so... but anyway, the RACE! Above, I am all innocence and smiles and unknowing anticipation of steep climbs, beautiful vistas, and really lovely landscapes approaching. Jason, Eli and I had driven down the night before, checked in at our motel, and then driven up to Ohiopyle, where the race starts to have a meal and check out where the race would start. I really like getting an idea before hand where parking is, where I'm going to pick up my stuff, where the trail will start, all that stuff so I can sleep a little better the night before. We hung out with the Youngs and the Gallagher's at the motel right before bed, I had a giant slice of Dan Young's famous chocolate cheesecake (which was heavenly). Then we were off to bed around 9:30. I slept ok for a few hours, then woke up at 2, nervous with anticipation. 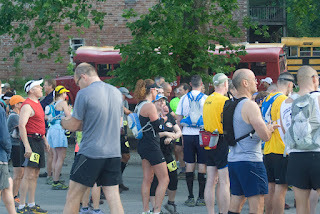 I finally got up at 5, and started my routine, gearing up, deciding to wear black, even though I was slightly worried about the heat, rejecting the idea of carrying my ipod, making sure I had my drinks, enough gels, and my emergency Swedish red fish ration for the last few miles. We headed down to the start (too early), got coffee and walked around. 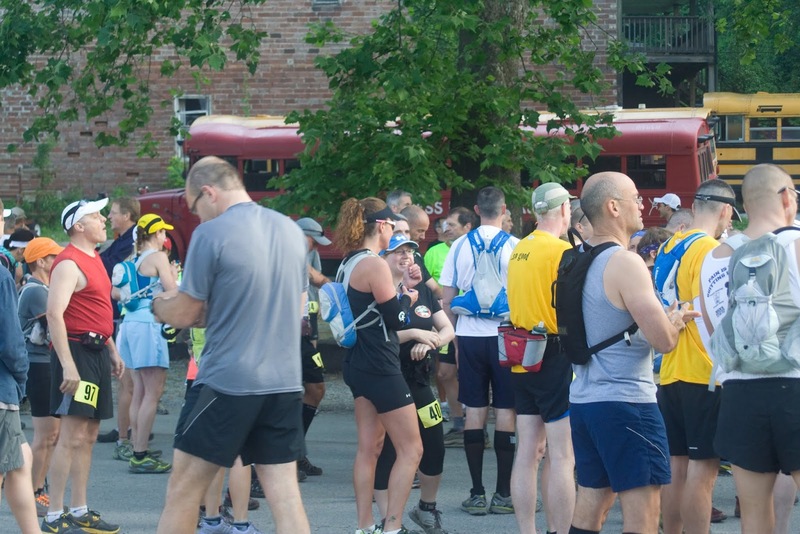 People started to gather in droves around 7:00, so I visited with a few of my running buddies, including my friend Patrick who's been motivating me from New York state since last year's Oil Creek 50k. We grouped up a few minutes before the 7:30 start. I clumped into the middle, waved to my husband and kiddo, and before I knew it, we were off. 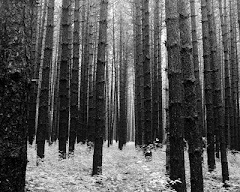 I started out at the same pace as the people I was with, on double-track for about a quarter mile, until we reached the single-track where we climbed up. Taking it slow was easy at that point. I ran gently on any flats, but the first portion of the race was mainly a series of ups and downs, then more ups. I fell in with a few of my NWPA Warrior friends, and we were going steady until about mile 6, where the trail took a decided upturn for the next 2 miles. I was taking the hills easy, but moving steadily up them. I wasn't really having too much of a problem with them. I noticed that my GPS watch was decidedly behind the lovely little trail markers that appeared in happy yellow every mile. I guess the elevation screwed the GPS up, so those markers were life-savers. I ended up cheering whenever I saw them, sometimes patting them, and I think I only missed seeing number 13. I took off a little fast after I reached the top of the ridge after mile 8. I was feeling great, and really opened up on the downhills and the flats, passing a few people, and enjoying my "skill" on the downhills. Little did I know that storming down those hills probably is what killed my quads for later in the day. I had left one of my friends behind on the big hill, and she had said she would catch up with me later, but I spent mile 8-14ish mostly on my own. I was doing well, enjoying the trail, enjoying the scenery, and bantering with runners around me. I came to the first aid station, filled my bottles, ate a banana and had some caffeinated soda, but didn't linger. 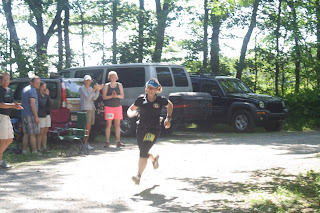 I knew I'd probably camp out at the mile 19 aid station, and I wanted to make it there before the 6 hour cut-off, which I knew by this point, I would do, but the idea of not getting there had haunted me so long in preparation for the race, that I just wanted to be through there. I few more miles along, and I caught up with my friend Patrick! I hadn't know if he was in front or behind me, but we stayed together for a few miles. He seemed to be doing really well, and we stuck together for quite a while. When we got to a long climb a few miles before the second aid station, he stopped. I stopped with him for a bit, but I was chomping to go, being the impatient sort that I am, and wished him well, and moved forwards. I had caught up with one of my Warrior friends, Sean, and not long after, Shannon caught up with us as well. We decided there is power in numbers, and stuck together. They were both having issues with the killer hills, where as I was now having a little bit rougher time with the downhills. We got to aid station two, hung out for a little while and fueled up. A few people were asking about a gentleman named Patrick, and it was his family! I told him I didn't think he was too far behind me. The three of us shuffled out, knowing we only had 12 miles left to go. Having company for those miles was invaluable. 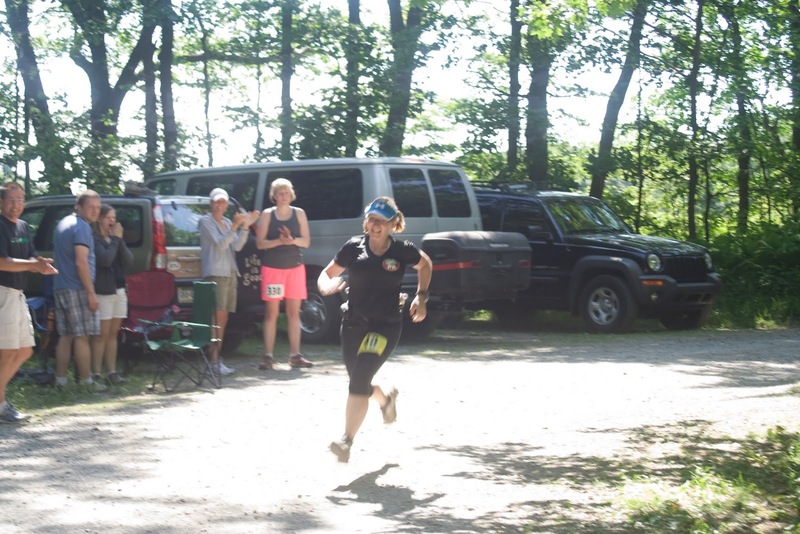 Something I ate or drank at the aid station had not made my stomach happy, so it and I had a silent and angry discussion while I forced myself to go on. I was not going to retreat into the shrubs while I was running with Shannon and Sean, though I did eye them a few times. After a couple of miles, the feeling passed, and we continued to run/walk/climb, cursing hills, wondering why we do this to ourselves, but enjoying a vista here, a rock formation there, and the general wonder that is the Laurel Highlands.